We thought we would introduce some new things in 2016 and so this series is all about a little behind the scenes of what we do, so lets dive in to what's on our desks this month. Now, as bloggers and day job person we have a few desks and so I am sure we will share our different spaces each time - to keep things interesting! First up is Sammy. My space has changed quite a lot lately as it has gone from just being my home desk in my craft room to being my second desk when I work from home. I am challenging myself to keep it clear of clutter, which is really hard for my 'messy bedroom' teenage self. I have been working on some things for a couple of magazines which I can't show you, but in-between I have been practising with the We Make Collective Calligraphy kit. I am loving getting back to working on my hand lettering skills, it's a nice break from working on the computer all the time. 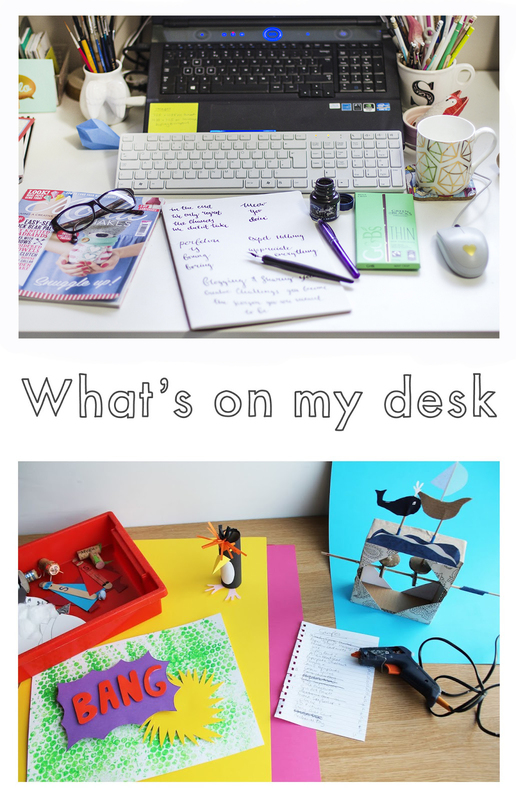 I have another desk at our Sew Crafty office, but it is covered in paper work at the moment, but maybe next month we will take a look at what's on my desk there. Now over to H. I thought I would show the day job side of my desk, my actual work desk is just scattered with paperwork and so I thought my studio space desk would be way more fun to share. I work at The Lightbox, as you may already know and a part of my job entails designing and planning workshops for children and adults. At the moment we are planning our next what's on brochure - so I am already thinking about what we are going to make in the summer holidays - so you get a sneak peek here, shhh, no telling! So this chaos you see in the picture is me making samples to photograph for the brochure and deciding what we can actually make in the time we have for workshops. Also it means delving into our store and finding all the materials I can use for the workshops. It's all very colourful and usually means using Pinterest alot to adapt things I find to make sure it is easy for 4 year olds or interesting enough for 12 year olds which can be a challenge. We hope you enjoyed that little peek into what we are up to right now, What is on your desk? We would love to see, tag us on Instagram @liveit.loveit.makeit so we can take a look. You can also check out our Office Pinterest board for a bit more inspiration to make your own office look cool - although I feel no ones office ever looks as good as those! This is a cool idea! I think you should make it a monthly feature and have guest bloggers! I would love to do it in 3 or 4 months when my home office is finally finished...right now my desk is in the corner of my dining room, which is full of plasterboard, half a bathroom suite, the entire dining room contents and all my sewing stuff. Yikes!! Great series idea gals! I like Anna's idea too, to feature other makers desks.